for JBT posts through online mode only. The official website of JBT in Chandigarh Recruitment apply for online application forms is www.recruit.nitttrchd.ac.in. The online applications are available from 08-10-2018 onwards. The candidates are required to login the website to submit the application. The last date to submit the application form through online is 01-11-2018. The candidates are shortlisted on the basis of merit in the written test. 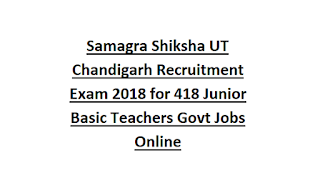 For other details of age limit, educational qualification, salary, application fee and how to apply are given below for the Junior Basic Teachers Posts in Samagra Shiksha UT Chandigarh Recruitment Notification 2018. 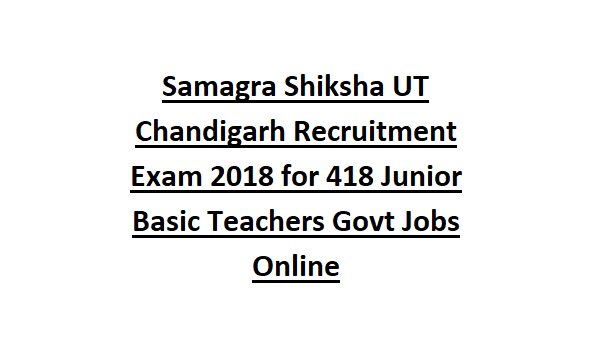 There are totally 418 JBT Posts are available in Chandigarh Recruitment 2018. The age limit for the Candidates or JBT Jobs in Chandigarh is in Between 21 – 37 years as on 1-1-2018. The age limit relaxation will be applicable as per the Government rules for the SC, OBC, Ex-Servicemen category candidates. The educational qualification for the candidates applying for the JBT jobs in Chandigarh is Graduation with D. El. Ed/ B. Ed & TET. The salary offered for the selected candidates is Rs.39422/-. The application fee for General category candidates is Rs.800/- and for SC category candidates fee is Rs.400/-. The last date for payment of application fee is 29-10-2018 (Up to 4:00 pm). Candidates can pay the fee online at the time of form submission. Display of fee conformation list is on 5-11-2018. Submission of proof of fee deposit is 8-11-2018. The candidates will be selected on the basis of merit in written examination. For more information candidates will check in the official notification. The exam pattern and Syllabus for JBT Jobs is written exam paper comprising of total 150 marks on objective type questions with duration is 2 hours 30 minutes. Qualifying marks will be 40% for all candidates. No interview will be conducted. Interested candidates can apply through online official website of Chandigarh for JBT posts is www.recruit.nitttrchd.ac.in from 8-10-2018 onwards. The last date to submit the application form is 1-11-2018.